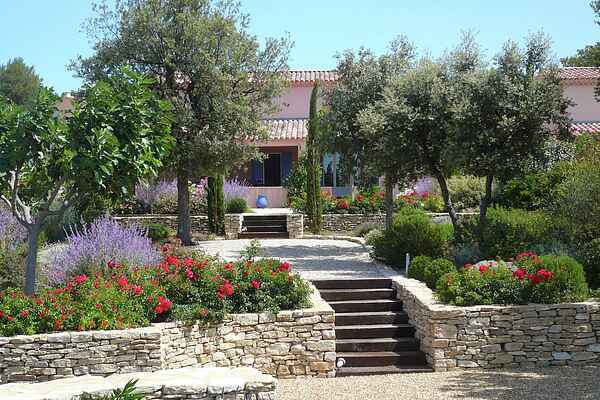 A magnificent view of the Luberon natural park creates the setting of this beautiful holiday villa. This house lies in a beautifully landscaped park, close to Saumane-de-Vaucluse (3 km) and the picturesque L'Isle-sur-la-Sorgue (3 km). Read a book or drink a glass of wine in your beautiful garden or on one of the lovely terraces. Enjoy fresh bread in the morning, thanks to the bread service (1/5 - 1/10). Life is great! Liveliness is key. L'Isle-sur-la-Sorgue has several shops and a Provençal Sunday market. Meander along the stalls that line the canals of the river La Sorgue. From La-Fontaine-de-Vaucluse (2 km) there is a walk to a mysterious source. In this beautiful place you can go for groceries and to a bakery. Golf enthusiasts will find an 18-hole golf course in one kilometre distance and for children there is an adventurous tree climbing park in Saumane-de-Vaucluse. This villa offers plenty of opportunities to relax, to do sports and to explore local culture. Beautiful Avignon, with its famous Papal Palace, is 33 kilometers away.